A few weeks ago, when Brian and I had dinner at the Central Park Boathouse, we got to enjoy a couple of their delicious specialty cocktails. I opted for the mango mojito and Brian was drawn to the French cosmopolitan. He and I both like traditional cosmos although they're a bit on the strong side for me. The Boathouse makes their cosmo with citrus vodka, although adding lime is the more traditional method. The French part comes from the addition of St. Germain. And since we're huge St. Germain lovers, how could we resist this. The drink that we were served was such a beautiful, bright color and had a nice elderflower fragrance. Back home, we recreated the drink and added it to our repertoire. Cheers! Combine all the ingredients in a cocktail shaker, fill with ice and shake well. 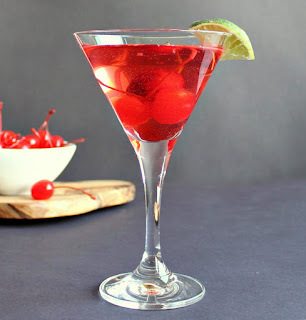 Pour into a chilled cocktail glass and garish with several maraschino cherries and a wedge of lime, if desired. It's Friday, I survived week 5 of baby, I need this! Ah, that looks good. TGIF! yum! Haha your inspiring my drink orders tonight... :) Have a great weekend! 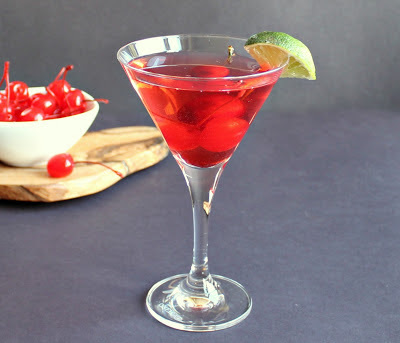 You always make such yummy cocktails! I need to come to your house for happy hour! Oooh, yes! I'm a huge fan of any cocktails made with St. Germain. I'm definitely going to give this a try!